This page will be changed frequently. Check back often. FIRST SPRING MEETING: Noon, Tuesday, April 3, Sem2, E4115. "Video Divina," Illich, "Ascesis," Buber, Meetings ("My Mother," pp. 21-3; "My Father," pp. 26-8; "The Walking Stick and the Tree," pp. 49-50; "Samuel and Agag," pp. 62-5; "Books and Men," pp. 71-3; three sentences on pp. 8-9 beginning, "These 'events and meeting'...). and Academic Advising self-assessment form. Arrive on time & wear comfortable clothes. Bring yoga journal & color pens/markers/crayons to construct body maps. Body theme: Yoga as an invitation to welcome and inhabit the body. Van Kooten image: Some treat the body as a cushion. Spring yoga handout with readings. BRING EVERY WEEK: Body Maps that we make this morning. Sister Lucy & Julie Barrett Ziegler. Berger, G, and Iyer, "Imagining Canada." DUE: Mind Map (on the readings done BEFORE class). See Heather's comments on mind maps and the mind map laws. Body theme: Introduce eye focus; principles of root and rise. Boccio: Many yogas, pp. 8-10. Van Kooten image: Flower of awareness. Steven Hendricks on G and cubism. Illich & Duden, "Guarding the Eye..." (2001) and "Scopic Past..." (1998) papers available on David Tinapple's website. Also read two papers by Lee Hoinacki. Click that link for annotations of seven selections on reserve in the library. Body theme: Introduce Drishti with yoga poses. Farhi: Ten living principles, pp. 7-16. Van Kooten image: Drishti--concentrating on one point, what do you see? DUE (8:45 AM): Response/image essay #1. Assignment here. Farhi: What are asanas and why practice them, pp. 16-20. Anusara image: Inner and outer spiral. PORTFOLIO REVIEW: Peer groups review portfolios. Fill out portfolio review forms and submit them to each student's faculty. Form will include a chance to note colleagues who might be at risk of receiving less than full credit. DUE: Mid-quarter self evaluation (see handout), with portfolio (download portfolio checklist here). Boccio: The Buddha's yoga, pp. 13-23. DUE (8:45 AM): body map assignment with anticipation of community service. Body theme: Imagery to work with blocks in the body and facilitate movement of energy. Boccio: The yoga practice and the Four Noble Truths, pp. 25-31. Van Kooten image: Block in the body. MONDAY: See room change, which applies for the remainder of the quarter. Classen, The Color of Angels, Introduction, chapters 3 & 5 (on reserve), Howe, Empire of the Senses, chapter 8, pp. 147-163. >con't students: "Thanks to Difference" and "Rebuilding the World"
>new students: "Being with the Other" and "Thanks to Difference"
Boccio: The Eightfold Paths, pp. 33-39. 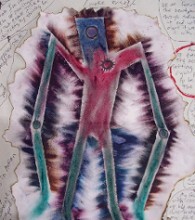 Van Kooten image: Wings of the back body. DUE:Independent Leanring Contract and first set of annotations. SUBMIT ILC ONLY to your seminar leader. See assignment here. MONDAY: Seminar from 11:30-12:30. Then, Chris Canty, pilgrimage to India followed by short Visio Divina by Heather & Sarah. DUE: Final self evaluation available for peer review. Caputo, On Religion, chapters 1, 2, & 5 (on reserve). Boccio:The Eightfold Paths, pp. 39-47. Van Kooten image: Daphne tree: Root and rise. This lecture is in lieu of the 3:30-5:30 all program meeting. Martha Nussbaum, "Tagore, Dewey, and the Imminent Demise of Liberal Education"
Rabindranath Tagore, "The Wrong Heaven"
Rabindranath Tagore, "The Parrot's Tale"
Also see entries on links page. 10:45-11:45 Martha Nussbaum in Longhouse 1007C. DUE: Final self evaluation to faculty: (1) hard copy along with colleague reviews and (2) email as attachment (make sure the attachment is compatible with MS-Word, i.e., that the file has a .doc suffix). Boccio: Learning dharma from a tree, pp. 247-249. Van Kooten image: Life takes you beyond your edge. DUE: Pilgrimage: Encounters with the foreign/body map assignment (assignment here). DUE: Peer-reviewed, carefully edited self evaluation (see handout and the faculty evaluation template: for students entering spring, students entering winter, and students entering in the fall), hardcopy and e-mail. Faculty will return comments on self evaluations by Monday. DUE: Final self evaluation, revised in response to faculty comments. Due Thursday at noon or at your evaluation conference, whichever is earlier. Van Kooten image: Power transcends beyond the skin.